Secondary double glazing works perfectly with listed buildings, properties within conservation areas and those looking to emphasise windows by providing an extra layer of protection and insulation. This barely-there barrier creates a discreet and subtle solution. Secondary glazing provides a thin single glazing glass pane that is easy to operate and extremely simple to maintain. With the single pane of glass, your property is guaranteed to be better protected from the worst weather conditions, creating a tight seal within the frame. 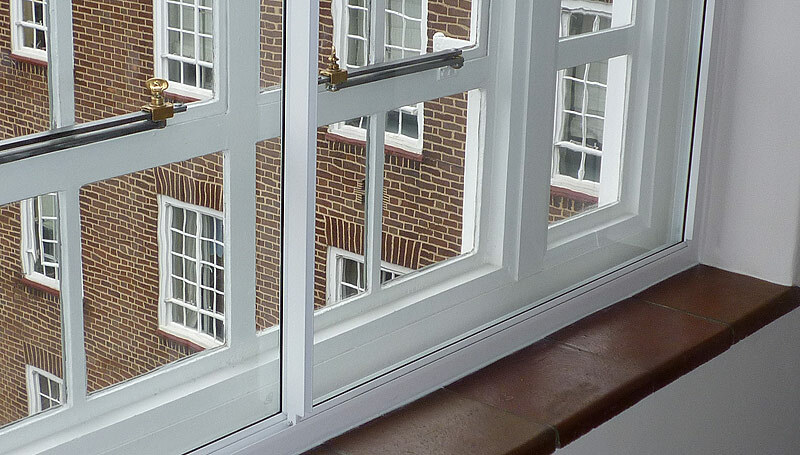 This is extremely important when existing windows are often old, loose fitting and draughty. We are proud to offer secondary glazing for your home, that can be made to any size dimension. We offer a range of exceptional secondary glazing products, which include; aluminium horizontal, vertically sliding, hinged and lift out options. You can customise your chosen secondary double glazing to seamlessly blend into your home with our range of different colours. Including the array of colours, you also have the option of including flyscreen glazing and the opportunity to install secondary glazing for commercial buildings, proving that it is great for any type of building. Let Abbey show you how much warmer your property can be with our exceptional secondary glazing offer, guaranteed to show results almost instantly. With heating bills rising and becoming more expensive, we have a quite an easy way of making sure your home is kept comfortable. The secondary glazing service we offer provides exceptional relief from cold and draughty living areas that were, otherwise, rendered inhabitable. The thin single glazed pane of glass acts as a second barrier sealing off your home from any cold spots and draughts, keeping you warm and comfortable all year round. We understand that when you get home, you want to have a bit of peace and quiet. This is why we are offering our exceptional secondary glazing unit to homeowners for their home improvement needs. The secondary glazing unit creates a seal between your home and the outside world, making it easy to keep your home life private and separate from the outside world. Make sure your home is tranquil with our secondary glazing. We understand that your home is not a clone of your neighbours, which is why we have decided to make sure each of our secondary glazing windows is fully customisable to suit your design needs. From colours and finishes to glass options, you can choose the perfect ones to suit you. As well as this, we can also tailor your unit to fit perfectly within the size and shape of the allocated space. Simply let us know what the design specifications are. Our secondary glazing is ideal for making sure your home is kept free from unwanted water ingress and harsh weather conditions. The tight fit of the unit in the space allocated makes it difficult for water and cold weather to seep in, keeping your home warm and dry. Harsh, strong winds also don’t stand a chance against our units. Made from tough glass, the single glazing unit creates a tough-to-pass barrier. If you are looking to better insulate your home, keeping it away from rough winds, harsh weather conditions and potential break-ins, but don’t want to replace your windows, we have the ideal solution. Our secondary glazing is perfect for you. Transforming your home from a cold, damp place to somewhere dry and draught-free, our secondary glazing is a cost-effective alternative to replacing your windows. If you have little children or pets running around, this is ideal for you. Our secondary double glazing unit is ideal for keeping little fingers and paws safe, by acting as a second layer between them and the window panel. This means there is a reduced risk of accidents. As well as this, your home is better protected against potential break-ins, with the secondary glazing unit acting as a protective barrier between yourself and intruders. If your property is unbearably cold in the winter and scorching hot in the summer with no middle ground, we have the perfect solution for you. Our secondary glazing is ideal for your property. With the ability to create a home that you can use all year round, you cannot go wrong with our service. To find out more, read below to ways you can get in touch with us today. Give us a call on 0118 907 1401 and talk to our expert team of advisers. They will be able to make sure our secondary glazing is ideal for your property, taking all your needs and wants into consideration. As well as this, they will be on hand to answer any questions you have about our products and services, giving you detailed answers in return, including a quick, no-obligations quote. Alternatively, send us an email using our online contact form. The emails sent to us will be read and replied to as soon as possible, with detailed answers being given to every question and query. Including this, they will be able to give tailored advice and a quick quote at the end. You can even request for a member of our team to call you back when you are free.